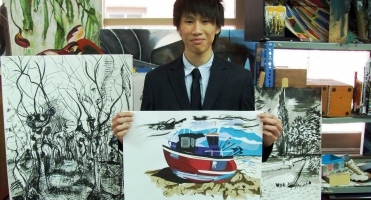 Battle Abbey School has announced that pupils Imogen Furness and David Cheng have been invited to exhibit at the Battle Contemporary Fine Art Fair 2011 which, now in its second year, will take place once again at The Powder Mills Hotel in September. Organised by Pure Arts Group and fast establishing itself as one of the most prestigious open submission contemporary art shows in the South East, the Fair showcases work by both emerging and established artists in a comprehensive range of media including painting, sculpture, printmaking, ceramics and precious metals. Submissions are invited from Artists aged 18+ living, working or studying in the South East are invited to enter for 2011/2012 selection. Ann Stewart, Head of Art at Battle Abbey School, said; "It is a real honour that the work of two Battle Abbey students has been selected for the final of the Battle Contemporary Fine Art Fair Competition." Imogen Furness has created a sculpture inspired by the tragic burning of Hastings Pier. Her father was among those of the RNL who fought to put the fire out. Imogen has used her father's experiences to produce an innovative sculpture using wood and other materials found amongst the ashes. David Cheng has created a set of collaged images inspired by views of the Hastings coastline - including fishing boats and views of the Pier; in a style reminiscent of the work of John Piper. "The Battle Contemporary Fair is an excellent opportunity for the work of such young artists to viewed by the public," David said. The 2011/2012 selection panel includes artist & fellow of the Royal Society of Painter Printmakers, Brenda Hartill R E; London gallery owner and curator, Ali Pettit; and VPRBA, FRBS, Vice President of the Royal Society of British Artists, Governor of the Federation of British Artists and Fellow of the Royal British Society of Sculptors, Guy Portelli. Taster exhibitions will be taking place at The Blackshed Gallery in Robertsbridge and the Roche Gallery in Rye.